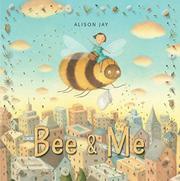 A little girl befriends a lost bumblebee in this wordless picture book. The scene opens on a bustling and ever-so-slightly surreal urban landscape; muted taupes and peaches give it a friendly if sterile look. A little white girl sits in a high-rise apartment reading a book on flowers when a large bee flies in her open window. In an eight-panel sequence, she fetches a fly swatter, causing the bee to back up against a windowsill, four whisper-thin legs held up in surrender, its two wide eyes visually echoing its dismayed O of a mouth. After consulting a book called Bee Culture, she prepares it a solution of sugar water, which the bee sips delicately from a spoon. She lets it go, but it returns, comically bedraggled, on a rainy day, and the friendship is cemented. The bee grows and grows until it’s big enough for her to ride, its human facial features and fuzzy, brown-and-yellow–striped body anything but threatening. (A stinger is conspicuously absent.) Together they fly to the countryside, harvest seeds, and sprinkle them in the city so that the next spring, it’s all abloom. Jay’s oil paintings are soft and delicate, offering delight in the details. Even as the girl bonds with the bee, she also befriends a little brown-skinned boy in the apartment above. A page of bee facts concludes the book, with a focus on pollinator-friendly plants for readers to plant to encourage bees in their own environments.